In my experience, MailChimp is great for promoting a product or brand on a regular basis. I use it in Higher Education to communicate about Student Organizations to Student Leaders on a bi-monthly basis. It works well when you have multiple, large audiences you are trying to communicate with. You can keep your lists in one place and send communication easier. MailChimp is not useful for small email campaigns. I'd say if you're emailing less than 100 individuals, this service is not ideal for you. Additionally, if you're not communicating at least once a month, it is not money well spent. On the other end, I would say communicating more than once a week is overboard, and will adversely affect your purpose for using the platform. Easy to Import Contacts: MailChimp accepts a number of files and formats, so no matter where your contacts are currently, you'll likely be able to import them fairly quickly without much issue. Customization options: There are templates to choose that can allow you to fairly easily make your design look like it's yours. If you happen to also have access to a graphic designer, then you can really take advantage of the customization options to make the design match your brand. Analytics: Being able to review data points like open rates and click-thru has allowed us to improve our communications and reach more people. Backend organization: I'm used to it now but initially it was very difficult to navigate the dashboard. I still get confused from time to time and have difficulty finding what I'm looking for. The organization just isn't very intuitive. The payment structure and credit system are incredibly confusing. We use the free version but had at one point considered paying for the full version. We had difficulty understanding how many credits we needed and abandoned the idea. Until we need more, like what marketing automation will give us, MailChimp does a great job for what we need at this time. It's easy to use, has a clean interface, and a reasonable cost that, when you are just using email at a minimum, makes it very attractive for a short-term solution. Plus, it manages opt-outs very well, so you never have to worry about cleaning a list before upload. I have enjoyed using MailChimp because it is easy to use and simple for the employees to fill out when asked. Great company. Great support. Wide range of solutions. The customer support clients really know about their tool and they were able to help my with all of my questions and problems, which over the years were quite a few. They're even motivated enough to drop a funny line here and there which perfectly matches their corporate language on the website. Try to customize it as much as possible. Explore the APIs if you are a web developer. We haven't used other similar products. We are able to directly communicate with our learners about their needs and improve their experience with our organization. We have been able to follow-up with learners and get feedback regarding our programs. We are able to accomplish our communication goals without it impacting our financial bottom-line. 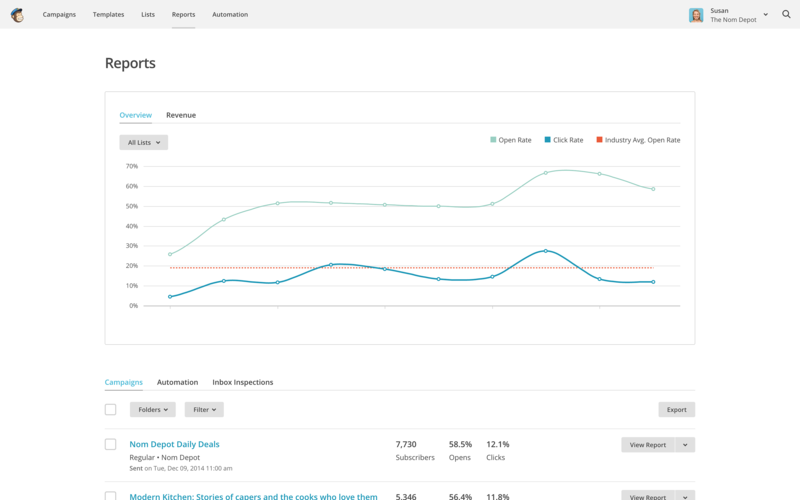 Mailchimp Reports - See open rates, click rates, unsubscribes, and even compare your results to industry averages right in the Mailchimp reporting interface.